The coconut definitive has not only weathered the storms of World War II and the Indonesian War of Independence, but also survived plane crashes. This aerogramme from Penang was salvaged from the crash site of BOAC (British Overseas Airways Corporation) Flight 783 in the remote Jagalgori district near Calcutta (now Kolkata), India, in 1953. It was marked locally (Baldwin 1966) with one of two or three hurriedly made salvaged-mail rubber cachets. Each line of text in the cachet is in a different typeface, beginning with the distinctive Copperplate Gothic of 1901 and followed by a serif and a sans-serif. This cachet has the notorious G-for-C error in 'Galcutta' (Baldwin 1966). The error probably came about amidst the haste and the difficulty of reading the characters flipped backwards as the chop was being fabricated. The overall kerning (distances between letter pairs) is visibly inconsistent, but nor was the rubber stamp maker or his equipment meant to typeset a monumental literary work. 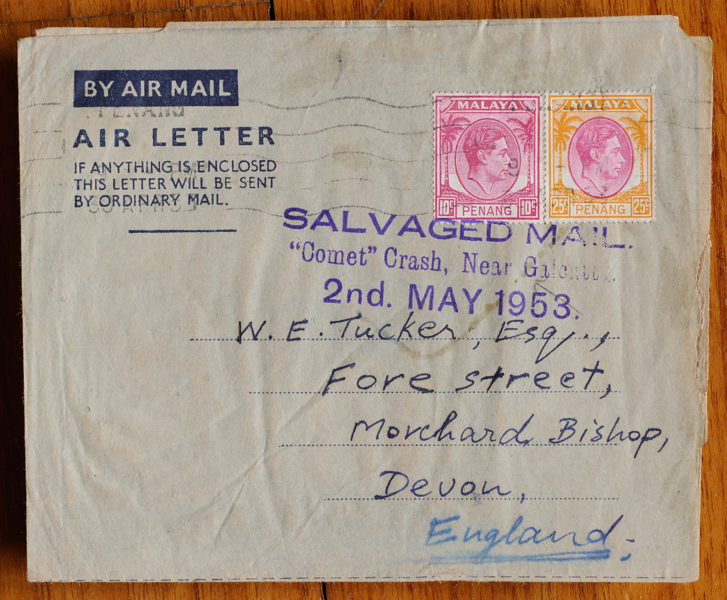 The machine franking of the stamps themselves is dated 30 April, two days before the crash, the same day the accident aircraft had been issued a certificate of maintenance in London for 73 flying hours. On 2 May 1953, the first anniversary of the maiden commercial flight of the Comet and 50 years since the first powered flight by man-made heavier-than-air machines, Flight 783 took off from Dum Dum Airport in Calcutta en route from Singapore to London. It flew into a severe thunderstorm and suffered a catastrophic wing failure and in-flight breakup while climbing through 10,000 ft. The dismembered sections of the airframe plummeted to the ground in flames. All 43 passengers and crew on board were killed. Some were on the way to London for the coronation of Elizabeth II. These colourful coconuts, stuck on the back flap to serve as envelope seals and festooned with a riot of circular datestamps, were embarking on the long voyage to England after bidding farewell to their rustic tropical 'hometown' (they had in fact been printed in London earlier) of Gemas in Negri Sembilan. Their destination was the University Correspondence College, a distance-learning institution established in 1888, and as it turned out a harrowing diversion had to be endured before reaching the sanctuary of Cambridge. On the front of the envelope, despite the empty space at lower left, the cachet was again applied in the cramped upper right quarter. One imagines that the task of applying the emergency cachets was extra work on top of regular postal duties, with limited time available to customize the positioning and rotation of the cachet. 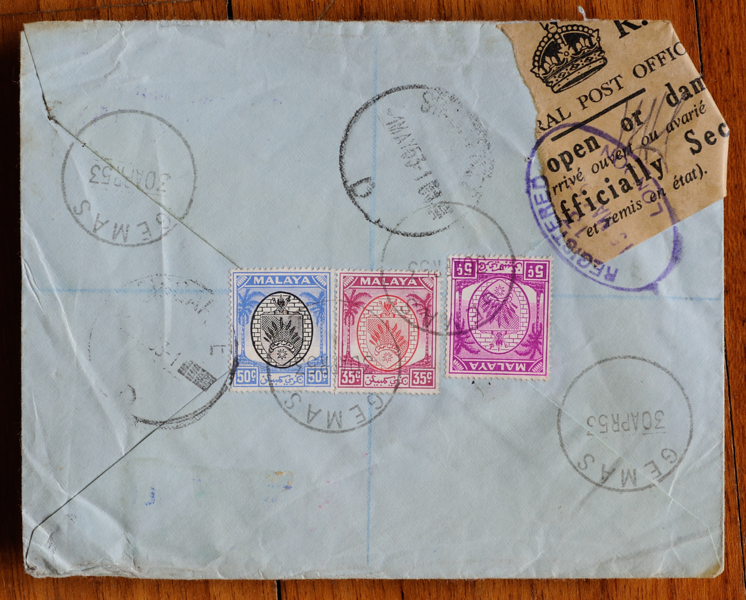 Nevertheless a standard operating procedure was probably in force to avoid overprinting the cachet on top of existing cancellations and stamps, so as not to obscure any postal information for subsequent processing. Some stormwater damage is evident as on the previous cover. Additional damage to the envelope is seen in the upper left corner. As this was a Registered letter, it was painstakingly resealed with the official label of the General Post Office in London, bearing the Imperial State Crown and torn to size. It apparently took two weeks for this to be done, as suggested by the date slug of 15 May in the violet registration chop on the back. It was not immediately realized that the Comet was unsafe. Queen Elizabeth II herself travelled on a Comet flight on 30 June 1953. It was only after two more fatal crashes the following year with no survivors that lengthy investigations would finally reveal the full extent of the Comet's dangerous structural flaws. Amid the withdrawal of the airworthiness certificate and grounding of the Comet fleet, sweeping design changes and radical innovations in avionics were introduced that made flying safer for future generations. This cover features an airmail étiquette in four languages including local Jawi and Chinese, embodying the cultural diversity of Malaya. 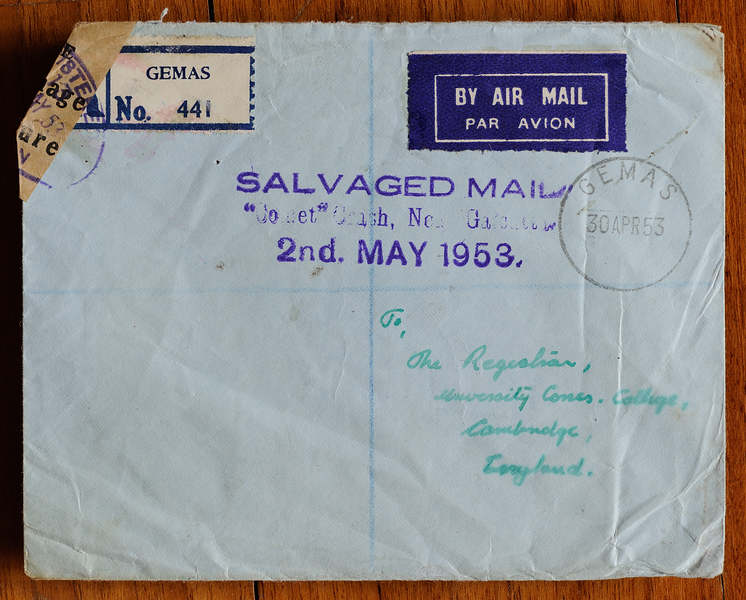 The sender was serving in the British Royal Artillery at the height of the Malayan Emergency. The words 'Forces Mail' handwritten above the étiquette indicated that it qualified for the discounted postage rates for HM Forces deployed overseas. 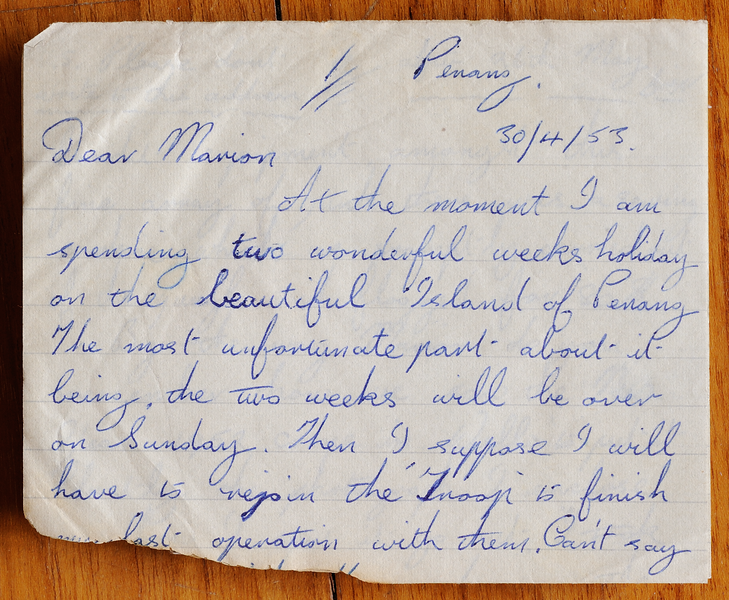 The letter departed Penang for Singapore as late as noon on the day before the crash. Here we see a second type of the cachet. The first line is typeset with a condensed version of Copperplate Gothic, with more letterspacing but less wordspacing than the previous cachet such that S A L V A G E D M A I L looks like a single word. The author suspects that this was not an exercise of artistic licence, but a case of adjacent letters not being able to be placed closer to each other for physical reasons. Consequently the distance between 'D' and 'M' was reduced out of the necessity of constraining the length of the first line to be no greater than the second. The second and third lines feature slab serifs, giving them a typewritten and mechanistic disposition. As usual we are having roasting weather, it makes me feel pleased that we are only three minutes walk from the sea. incidentally the sea is where most of my leave has been spent. Since I last wrote to you we have had another profitable patrol. This time we found quite a big camp that contained a large amount of bandit equipment, amongst this fine array of junk there was a sewing machine, which we promptly carried out of the jungle and flogged for 80$. By the way Marion do you remember how we saw the New Year 1952. come in. Well to put it bluntly the photograph I enclose was how I saw it go out. I took [paper torn off] down on the 31st Dec, 1952. on the Kati rubber estate, I just thought you might like to see how 52 went out at my end. There doesn't seem to be very much more to tell you at the moment so I will close hoping everyone at your house is keeping fit and well. In all, five different fonts are shared between the two cachets. The use of so many incongruent typefaces is probably a symptom of the limited lettering available of each typeface in the workshop. Nevertheless, the authorities standardized the wording for both cachets to eliminate any possibility of confusion as to the incident referred to by them. The crash of G-ALYV was probably the first time in history that Malayan mail was involved in the crash of a jet aircraft, yet it has received scant coverage in Malayan philately. A survey of philatelic auction catalogues indicated that besides Penang and Negri Sembilan, points of origin of mail carried on the plane included Brunei, Burma, Hong Kong, India, North Borneo and Singapore. 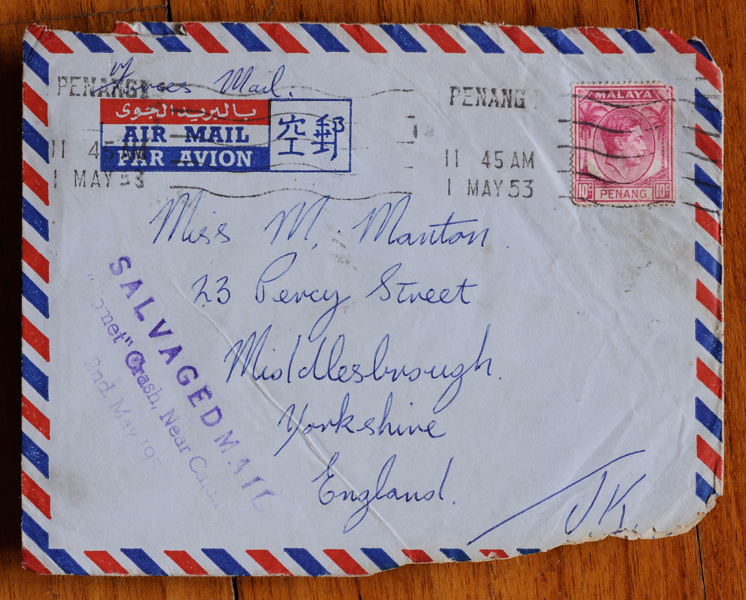 See Holley (2015) for an overview of Malaya disaster mail. Another plane carrying coconut definitives went down in bad weather on Christmas Day 1954 in Prestwick, Scotland. The BOAC Boeing 377 Stratocruiser, nicknamed Cathay and registered G-ALSA, was en route from London to New York and carrying a £900,000 consignment of diamonds. The author has seen a cover bearing several coconut definitives of various denominations, including a half-burnt $1 and two stamps with the crash cachet applied directly on them.